One of the best ways to ensure that your pet has a long and happy life, is to bring them in for a regular veterinary check-up at least once each year. Your local veterinary clinic in Dartmouth, Massachusetts can help you decide how often to bring your pet in for an exam and evaluation, based upon your pet’s health, age and lifestyle. A professional veterinary clinic can help you with basic services, such as vaccines, preventive treatments for fleas and ticks, feline or canine dental care and even solve specific problems, such as anxiety issues in dogs. Taking the time to bring your pet in for a veterinary check-up can help keep your pet healthy and give you the tools and insight necessary to prevent many of the common problems that can affect pets in the South Coast region throughout the year. Another way to keep your pet healthy is to avoid feeding them too many treats. Commercial treats are sort of like “junk food” for humans, and you might be surprised to see just how much sugar, salt and calories are hiding in the most popular brands and types. Rather than feeding your pet a lot of processed foods and treats, or giving in and allowing them to eat human foods, you can actually make your own autumn treats at home. Pumpkin is a very healthy treat for pets. In fact, one of the natural prescriptions for dogs that have urinary health issues is powdered pumpkin seed. Pumpkin is often used by dog owners, trainers and veterinarians to solve other medical conditions, such as diarrhea, constipation or upset stomach. Pumpkin is naturally high in natural oils and fiber, which are what help it to be so beneficial to digestive issues. Low in calories, pumpkin is a great stand-alone treat or ingredient that can be used to keep your dog healthy and happy during the fall, as well as all year long. Before you begin to cook any type of treat or food for your pet, consult with your local veterinary clinic in Dartmouth to ensure that you won’t be doing more harm than good. Some pets have allergies to certain ingredients, while other seemingly harmless ingredients can be toxic to dogs and cats. When you come in for a veterinary check-up, canine dental care or treatment of anxiety issues in dogs, make sure to ask about making treats for your kitty or pooch and get some solid advice from your South Coast veterinarian. 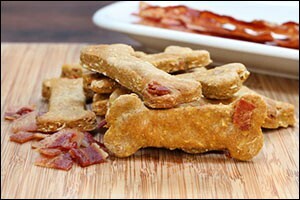 One of the most popular treats for dogs is crunchy biscuits. You can make your own custom dog biscuits at home just by using some basic ingredients that you probably already have on hand. Customize the recipe by adding other things that your dog loves, such as chopped, cooked bacon or cranberries, to increase the flavor level and provide additional nutrients. Preheat your oven to 350 degrees and start by blending the eggs and pumpkin together in a large bowl, using a whisk. Next, in a separate bowl, mix together the dry ingredients, including the whole wheat flour, dry milk and salt. Fold in the pumpkin mixture and add water to the dough, as needed, to make it workable. The end result should be a dough that is dry and stiff, not watery and wet, with a bit of crumb for texture. Use your hands to mix and blend it completely, to ensure a proper mixture. Extra “custom” ingredients can be added when the pumpkin mixture is folded into the dry ingredients. Choose pet safe options, such as cranberry, bacon, shredded carrot and apple. Avoid toxic ingredients, such as onion, garlic, raisins and chocolate. Roll dough out to about 1/2 inch thick and cut into shapes with small cookie cutters, such as dog bones or animal shapes. Place the cookies an inch apart on an un-greased cookie sheet lined with parchment paper. Bake 20 minutes and then turn the biscuits over, baking for an additional 20 minutes or until completely cooked through. More baking time may be needed, depending on the size of the biscuits. Contact Anchor Animal Hospital, an emergency and veterinary clinic in Dartmouth, Massachusetts, to schedule your annual veterinary check-up for your dog, cat or other type of pet. We provide a wide variety of services, including feline and canine dental care, as well as advanced treatments for pain management, anxiety issues in dogs, preventive seasonal treatments and much more. Call today at 508-996-3731 to learn more about our veterinary hospital or to schedule a veterinary check-up.